The Ukulele is a wonderful instrument for kids - cheap and cheerful and ready-made for kids' small hands. Most Ukulele books introduce chords from the first page, but chords can be difficult and frustrating for child beginners. This book and accompanying audio gets kids playing recognisable tunes right from the get go. The material includes both standard notation and tablature clefs. 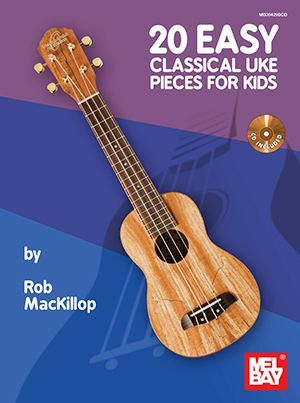 20 Easy Classical Uke Pieces For Kids is written in Ukulele tablature to make learning fun and easy. The arranger, who comes with 25 years of teaching experience, has laid the foundations for good fingerstyle technique, making 20 Easy Classical Uke Pieces For Kids both fun and educational.